This weeks photo challenge is GREEN. 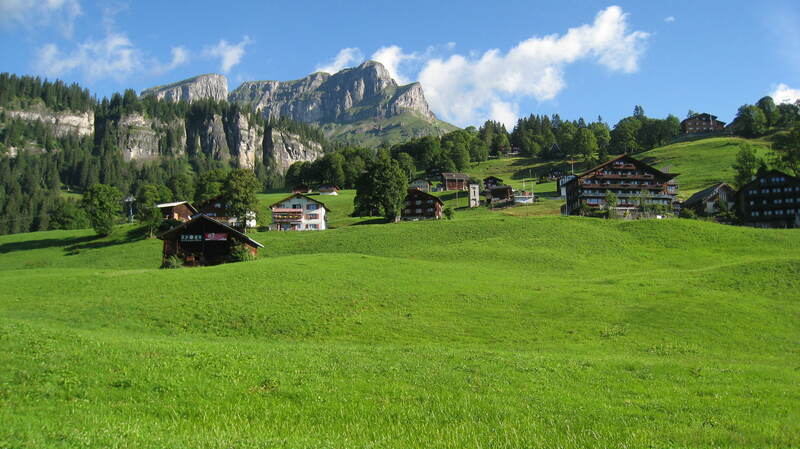 I took this photo in the Swiss Alps (the Braunwald Area), maybe the most relaxing and greenest place I have seen. This entry was posted on November 17, 2012 by kdawikstrom. It was filed under Nature, Road Trip, Switzerland, Travel, Weekly Photo Challenge and was tagged with Braunwald, Green, Gumen, Photography, postaday, Schweiziska alperna, Swiss Alps, Swiss Mountains, Switzerland, weekly photo challenge. Wow, I can’t think of a better word than green. I wonder how people are making a living here with all green around and none of them bearing flowers or fruits. Just kidding. Indeed, this is a relaxing photo. Thank you. I thought your garden photos also looked very relaxing, and more fruitful than mine. Yes, it was such a wonderful day! How pretty!! Looks so relaxing! Green is my favorite color – do you know that Norway is the greenest country in the world – with 53 shades of green and Ireland has only 52 – must be an Norwegian that has counted. *smile – this photo is great. Love your header photo of Hong Kong – one of the best photos I have seen … of Hong Kong so fare. Wow, it’s so beautiful that it’s almost surreal! Great job! Best, G. E.
Thanks a lot, appreciate it! Yes, it was lovely spending som time there. Yes – I would love to go back! I love that place! What are the buildings? Wow! The picture is so clear & vivid. It’s gorgeous! It was a stunning place to be! Photographs, musings, culinary commentary, and global travel adventures!